We all have internal biases that lead us astray. We all want our top investigative bodies to be headed by competent officials. We also all want to ensure that these officials can freely investigate other branches of the government - including the presidential administration - without fear of retribution. How can we tell whether Donald Trump’s firing of FBI Director James Comey was meant to ensure competent leadership of the FBI, as Trump claims, or to prevent Comey from digging deeper into Trump’s potential connections with Russia, as many Democrats claim? Our personal political perspectives will strongly influence us to favor one explanation or the other, regardless of the truth. According to behavioral science research, our minds tend to interpret new information in accordance with our past beliefs - a thinking error known as the confirmation bias. Fortunately, we can fight the confirmation bias in such situations by evaluating the opinions of people who both have the most information and have political motivations to support one side, but fail to do so or even support the other side. Altogether, about 40 Republican members of Congress have expressed concerns over Comey’s firing, while virtually every Democrat is calling for an independent commission or special prosecutor to evaluate Comey’s firing. While some of these Republicans are known for breaking ranks at times, such as Senator John McCain, many others - such as Corker and Burr - are mainstream Republicans who generally toe the party line. This data on many of those in the know - federal lawmakers - who have clear political motivation to align with Trump firing Comey instead broke ranks provides strong evidence that the decision to fire Comey is less about incompetence and more about the Russia investigation than anything else. Another thinking error playing a role in clouding our judgment is illusory correlation, namely an incorrect - illusory - perception of a connection between two events. Trump’s administration claimed, in a memo by deputy Attorney General Rod Rosenstein that Trump referenced in his firing of Comey, that Comey lost support due to his handling of the investigation into Hillary Clinton’s email server. 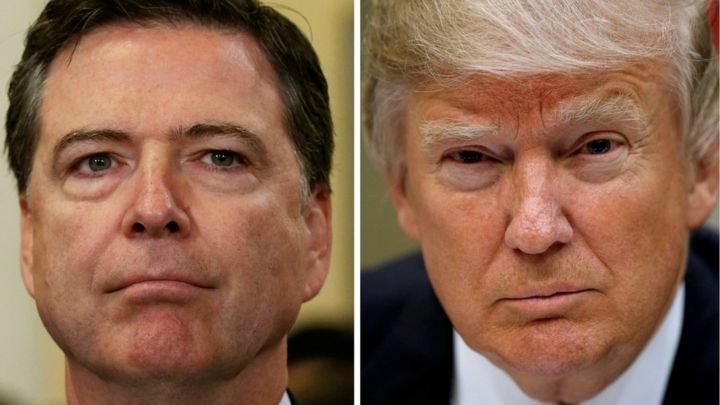 Democrats claimed that Trump fired Comey because of Comey’s investigation into the Trump-Russia connection as part of Russia’s meddling in the US presidential elections. Fortunately, we can use another technique from behavioral science to correct for this thinking error - consider the alternative. Consider a situation where Trump’s true concerns lay with Comey’s Clinton email server investigation. When would Trump fire Comey if this was the case? Trump would fire Comey when Trump entered office, as Trump did with a number of federal attorneys. Instead, Trump specifically made a decision to keep Comey in office when he took the presidency, despite knowing about Comey’s handling of the email server. Trump specifically indicated, in a message loud and clear for the government investigative bodies, that he would not pursue any further investigation into Clinton’s email server shortly after he was elected. As late as April 12, long after Trump had access to any secret information about Comey’s handling of Clinton’s email server and any other information relevant to Comey’s pre-election activities, Trump said in an interview with Fox Business Network “I have confidence in [Comey]." Given this evidence, it seems quite unlikely that the real reason for Comey’s firing is the Clinton email scandal. Now, this behavioral science-based conclusion does not favor the conservative perspective, and instead favors the liberal one. Will it mean that conservatives dismiss it out of hand? To determine if this is the case, I went on the conservative radio network 700WLW to speak on this topic with the well-known radio show host Scott Sloan two days after Comey’s dismissal. Sloan is known as a strong proponent of Christian and conservative values but not someone who practices post-truth politics by dismissing the truth in favor of his personal beliefs. We had a civil discussion, during which Sloan acknowledged the validity of this behavioral science-informed perspective and accepted that the evidence pointed against Trump’s narrative. It is highly likely that our conversation on his radio show swayed some of his conservative audience to change their perspective as well. This interview shows the benefits of using such behavioral science-based approaches to bridge the political divide and have reasonable conversations that result in people going against their current values and changing their minds to match reality. What it takes is knowing why our minds are likely to lead us astray and addressing these internal biases using science-informed strategies to do so. In this case, the evidence - once corrected for political bias - points conclusively, in a way that both reasonable conservative and liberals can agree on, to Trump firing Comey due to concerns over the FBI’s investigation into Russian interference in the election.